At first glance, the new 63mm sprinkle caps seem to be standard items, the sort you might find on just about any herb or spice product in your local supermarket. It's a new product for Kornelis, but one that clients have been clamouring for for quite some time. The Kornelis version of the tried and true two-sided sprinkle cap is a bit improved, though. First and foremost, it's a continuous thread closure, meaning it can be integrated into existing lines with the right thread type without any fuss or mess. Next, the top is completely flat. No inconsistencies, no flaws, meaning consumers can stack them more easily or affix a label without fear of having it peel off. The best part is the precision with which the caps are made. 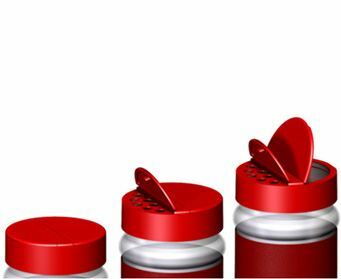 While many other sprinkle caps seem to warp one opened, resulting in poor re-closing or the living hinge becoming unusable or snapping, our caps are built to last from first use all the way through last, ensuring the consumer has a positive experience with your product and will return for more. Suitable for herbs, spices, etc.